Now the Soviets have a dedicated utility troop transport like the Americans with the Huey Hog and the Brits with the Westland Lynx. Just replace the Hinds in your Afgantsy Air Assault or Red Banner Assault Landing Companies and you're set. But, i was planning to put passengers à 6 value. Because, Mi24 : 8 passengers in real, passenger 2 in TY. Mi17 : 24 Passengers in real (3 times more) --> passenger 6 in TY. They really need to officially introduce this into TY. 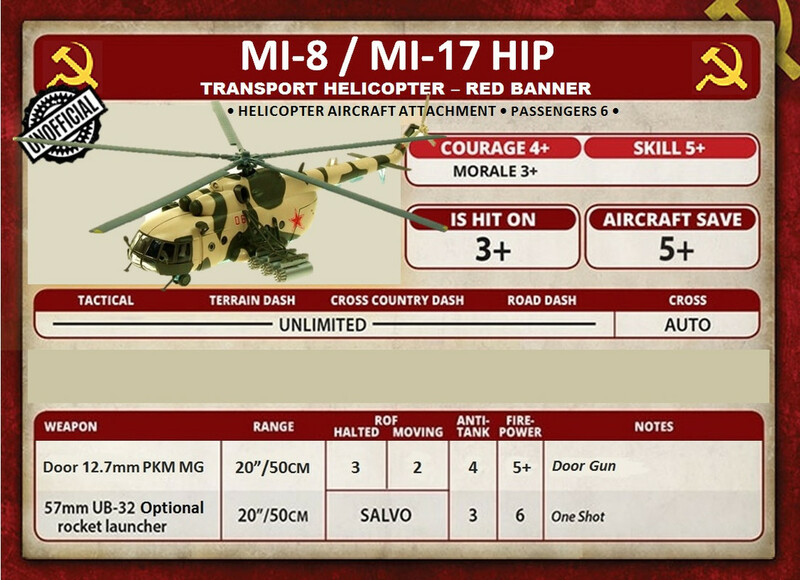 I don't play it myself but without the Mi-8 you severely hamper 80s Soviet airborne operations. That would be a plus for the WarPac side in the game,much as a CH-47 or 53 would be for NATO. I'll revise it to Passengers 6 and repost tonight. They don't have a Soviet airborne list in TY. They've said they will not be making an MI-8. They say it's not cost effective. Absolutely. BF wouldn't sell many of them due to the MI-8's large troop carrying capacity. If they do release it, it would be in resin/metal like the USMC AAV7 (which also has a large transport capacity). I'm assuming people use the QRF model as I don't know who else offers one in 15mm/1:100. I'll post one tonight. Heller has a model in this scale. Not saying I'm going to entertain requests from all comers though, sorry. Phil said that after between Red Thunder and Stripes, and I don't think it was about cost-effectiveness, but rather "nobody would buy a giant transport helicopter. Transport helo wouldn't sell." Phil's comment is totally about cost-effectiveness from a cost-vs.-benefits standpoint. 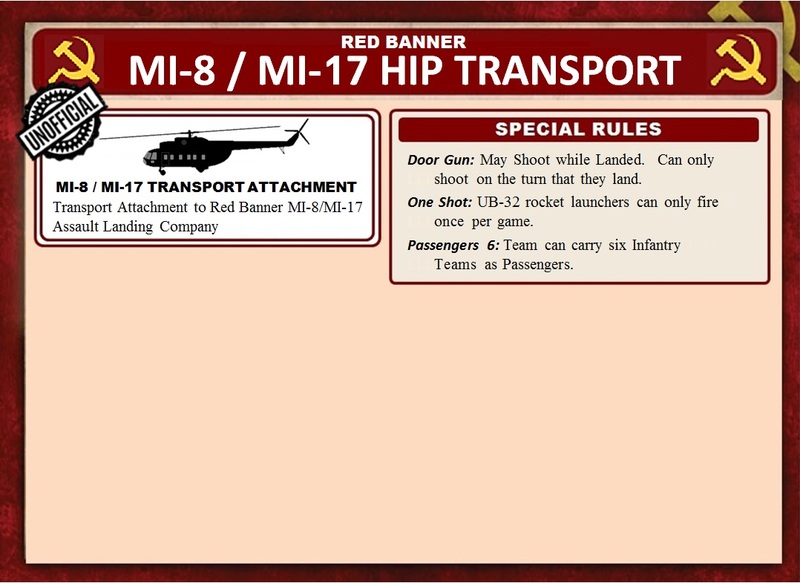 BF doesn't project selling enough MI-8's in its forecast to justify releasing it. BF doesn't project selling enough MI-8's in its forecast to justify releasing it. The VDV list that probably would sell well is BMDs, but you can basically counts-as a BMP battalion. PSC have their MI-8 on the way to the print shop for mastering!